(Nanowerk News) Researchers at the University of Tokyo have developed a superconducting magnet system to create a quasi-microgravity environment where protein crystals of high quality are formed. Furthermore, the system is equipped with an optical device to observe the crystal growth in place and in real time, enabling the high-throughput production of protein crystals without interrupting the crystallization process (Scientific Reports, "In-situ and real-time growth observation of high-quality protein crystals under quasi-microgravity on earth"). The novel system will contribute to progress in basic and applied structural biology. Precise structural information of proteins is essential to deeply understand protein functions and develop novel biological products, such as pharmaceutical drugs and industrial enzymes. However, precise protein structure determination through crystallographic analysis requires crystals of high quality which are difficult to form, calling for the exhaustive search for the appropriate experimental conditions among thousands of possibilities. On the other hand, it is known that the natural convection of solutions is suppressed in an environment such as space where gravity has almost no effect and high quality crystals can be obtained. Consequently, there is great demand for a system which allows the protein crystallization to occur in an environment where the effect of gravity has been removed on earth. 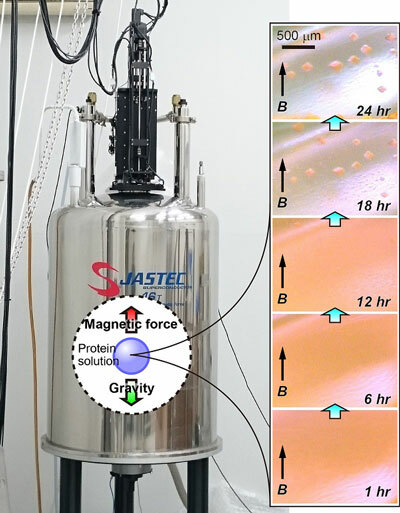 Professor Masaru Tanokura with his research group at the Graduate School of Agricultural and Life Sciences of the University of Tokyo have developed a protein crystallization system comprising a superconducting magnet generating strong magnetic forces to cancel out the effect of gravity and an in-place microscopic observation device. The system also makes it possible to carry out multiple crystallizations in one experiment, and all the sample drops in which crystals are grown can be sequentially observed in real time without taking out the samples from the magnetic field of the system, enabling efficient crystallization experiments to be performed. This system was developed in collaboration with the National Institute for Materials Science, Kiyohara Optics, Inc., Ajinomoto Co., Inc., and Kyoto University.